Hannah Clifford, who was born in Corsham in Wiltshire in 1784 was, as Ancestry puts it, the “2nd great- grandmother of husband of sister-in-law of great-aunt”, so not a particularly close connection! She does however lead into an interesting and somewhat complicated story. On the 31st August 1804 Hannah gave birth to an illegitimate daughter Louisa. When Louisa was baptised six years later on the 26th August 1810 at Box in Wiltshire, Hannah was married to James Arlett, a stone quarryman, and they’d already had two children since their marriage in Box in 1807. Hannah was honest, and Louisa was baptised as Louisa Clifford with no father named in the parish register. Hannah and James went on to have a further six, possibly seven children, and lived in Washwells. Louisa Clifford Louisa followed in her mother’s footsteps and had an illegitimate daughter, Elizabeth Jane Clifford born in Box in 1829. She was baptised, with no father named, on the 5th July 1829 in Corsham and a pencilled note in the register margin queries why an illegitimate child from Box is being baptised in this parish. Louisa married Nathaniel Butler, a blacksmith, on the 26th October 1833 in Corsham; they don’t appear to have had any children. In 1841 Nathaniel is living on his own in Box Hill, and by 1851 he is living at Box Quarries with Jane Hancock as his housekeeper and has had three children with her, the first being Caroline, baptised on the 20th December 1840. In 1841 Jane and her daughter Caroline are living with Jane’s widowed mother. With Jane’s mother living in the same household as Jane and Nathaniel in 1851 and more Hancocks living as close neighbours everyone must have known what was going on. It would appear that Nathaniel was getting the sympathy vote: he needed a family life, but couldn’t re-marry while his first wife was alive. Nathaniel finally married Jane in Bath in 1866, and they are back living in Box Hill in 1871; he must have decided that Louisa was dead. However Louisa was very much alive; she next appeared in Leeds, when with her daughter Elizabeth Jane they both get married on the same day: the 17th January 1848. Elizabeth Jane Clifford married George Pinnell; she invents a father for herself - John Clifford, and claims to be of full age. George, who says his father is Robert Pinnell, is another native of Box in Wiltshire and he was baptised there on the 4th September 1825 to parents Robert and Mary. His occupation is labourer, but in other records he appears as an excavator, miner, and a railway labourer, a job which probably drew him, his future wife and mother-in-law to the north. One of the witnesses is George Glanville, and it was he who married Louisa; George Pinnell was one of their witnesses. Louisa marries under her married name of Louisa Butler, but says she is a spinster, and claims her father to be John Butler (which was the name of Nathaniel’s father). George Glanville had been born in Millbrook in the parish of Maker in south-east Cornwall, and he was baptised there on the 10th January 1813 to parents Robert and Mary. He had an intermittent career in the Royal Navy, and although calling himself a labourer on the marriage certificate he was a Greenwich Pensioner and he was to return to the service after his marriage. I have no idea how he came to be in Leeds, unless between ships he too worked as a railway labourer, though shipwright is his occupation of choice in 1841 and 1871: presumably a carpenter had transferable skills. In 1851 he is living with Louisa in Fulham Bridge Yard, St Margaret Westminster; they have no children. In 1861 he is on board HMS Wellesley in Chatham dockyard, and Louisa is living just across the Medway in Frindsbury with her granddaughter Jane Pinnell, who aged 7 was born in France. 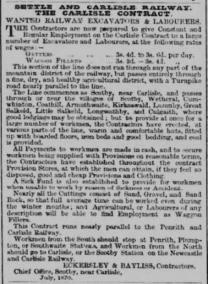 1871 finds him finally retired from the service and living on his Navy pension of £29 16s per annum in Deptford; as he gives his occupation as shipwright it sounds as if this is supplementing his income. At home with George and Louisa at 20 Abinger Road are granddaughter Louisa Pinnell aged 15 and born in Lambeth, and two nieces: Sarah Lines aged 23 and born in Horsforth, Yorkshire, and Jane Tanner aged 22 and born in Box in Wiltshire. These two are the daughters of Louisa’s half-sisters: Eliza Arlett who married John Lines, another railway labourer, and Jane Arlett who married Thomas Tanner, a stone quarryman. George Glanville died in Greenwich in 1872, and it is probably Louisa’s death registered there too in late 1881 as Louisa Glenwell. In the 1881 census she’s a widow aged 82 still living at 20 Abinger Road and now with two boarders. Elizabeth Jane Clifford & George Pinnell Louisa’s daughter Elizabeth Jane Clifford had five children altogether with George Pinnell: the first, Louisa, was born in 1850 back in Box in Wiltshire, and died that same year. The 1851 census finds George and Elizabeth Jane living in Ealing, when George is a Railway labourer; how their next daughter Jane came to be born in France in about 1854 is a mystery, but I suspect he was working there on a railway contract - she gives this as her birthplace consistently through the censuses - except for once when it becomes Belgium. A second Louisa was born more logically in Lambeth in 1856; she was followed by Robert born in Clerkenwell in 1861, and both these children were baptised at St Phillip’s in Clerkenwell that year, though not on the same day. They are living at 5 Easton Place, and George has the occupation of Miner on both occasions. It is a pity that they aren’t at that address earlier on in the year, as I can’t find them at all on that census, and by 1865 they are living in the Barnet area of Hertfordshire when a daughter Elizabeth was born. As a railway labourer - and the more skilled excavator or miner - George’s work would take him around the country to where the railways were being built. So after 1865 George and Elizabeth Jane went north, leaving their two older girls, Jane and Louisa, in the care of their grandmother, Louisa Glanville, and taking the two younger ones with them. By 1871, however they seem to have gone their separate ways. George turns up in Yorkshire, with his description appearing in the Police Gazette of 10th February 1871 when he was charged with larceny from the person at Rosedale, West Side and committed for trial at the next Northallerton Quarter Sessions: GEORGE PINNELL, a joiner, 45 years of age, 5 feet 8 inches high, blue eyes, brown hair and whiskers, sallow complexion, lame from having both legs broken, scars on both elbows, on left shoulders, and back, and states that he is a native of Box, Wiltshire; dressed in fustian clothes, dark cape, and strong lace-up boots. When the case came up at the North Riding Sessions the following April, George and his co-defendant Charles Deverex, both described as miners, were found not guilty of “stealing five sovereigns, eight half-sovereigns, and other moneys the property of James Kneeshaw, at the parish of Lastringham, on 27th January, 1871”. At the time of the 1871 census George would have been in prison awaiting trial; surprisingly Elizabeth and the two children are on the other side of the Pennines in Culgaith living in a railway construction camp hut as the wife and children of a John Lawrence. 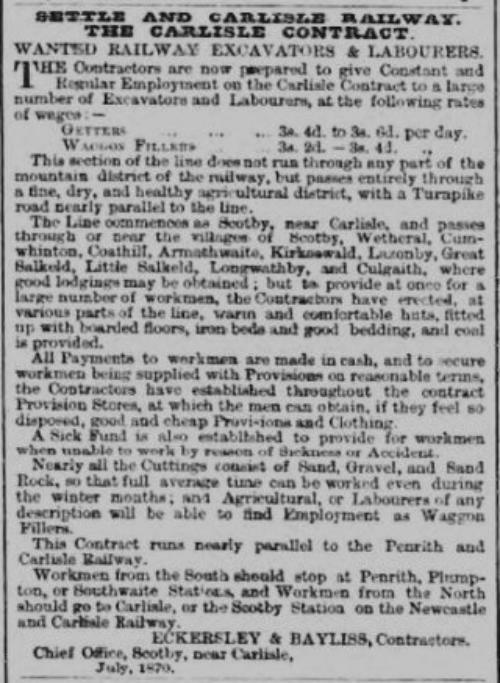 The Culgaith section of the Settle to Carlisle railway was being built at this time and while I’m sure regular railway workers would have known where they would be needed, this advert that appeared in the Clerkenwell News on the 23rd July 1870 at least describes the living conditions that they could expect. For the labourers it was hard and dangerous work, and the Penrith Observer for the same month describes the wooden huts, stabling and tommy shops at Culgaith, while works there included brickmaking, the construction of a raised embankment, a deep cutting and "a tunnel six hundred yards long which passes underneath the road at a depth of about fifty feet but which further on is at considerably above 100 feet below the level. About the centre of this a shaft 100 feet in depth has been sunk, and in this gangs of men work day and night by alternate shifts ... Blasting becomes necessary every few hours." The miners and excavators would have been doing this digging, and it must be obvious how George over his lifetime had come by the injuries mentioned in his description. Whether he was ever at Culgaith is open to question, and after his release in Northallerton he seems to disappear from the records. Elizabeth Jane and John Lawrence had a son, John, born at Culgaith and baptised in the parish church there on the 13th August 1871; according to the 1871 census John Lawrence is also working as a miner. By 1881 the family, but minus Elizabeth’s son Robert, is living in Swansea; John is now a Navvy Foreman, Elizabeth’s daughter Elizabeth Pinnell, now aged 15, is a domestic servant. John Lawrence senior died before 1891, and in that census Elizabeth is living in Cadoxton juxta Barry with her son John: Elizabeth is a retired Tailoress - back in the Hut in Culgaith she described herself as a Dressmaker - and John is an Engine maker; she confirms her place of birth as Box in Wiltshire, while John prefers the better known Penrith. Elizabeth Jane Lawrence (though as far as I can see she never married John) probably died in 1900 in the Newport, Monmouthshire registration district. Her son John Lawrence may appear on the 1901 census in Cardiff as an Engine fitter with a wife Louisa; her children Robert and Elizabeth Pinnell are proving very difficult to trace any further. However the two daughters who remained in London, Jane and Louisa, do have stories to tell. Jane Pinnell Jane Pinnell married John Varnham on the 21st July 1873 in the parish church of St Paul in Charlton in Kent. John and his father William are both Lambeth fishermen, and the witnesses are Jane’s sister Louisa, and John Lawrence, who was effectively Jane’s step-father. Presumably her mother and other siblings were there too, before they went to live permanently in south Wales. John Varnham and Jane had seven children born between 1875 and 1888 in Greenwich, where they lived first in Bennett Street and later at Crowley’s Wharf. John died in November 1889 and in 1891 Jane is lodging at 92 East Street, Greenwich and gives her occupation as Charwoman; none of her children are with her, not even the three-year-old Frederick who turns up in the Greenwich Workhouse in 1893, and on the Training Ship Exmouth in 1899. Elizabeth, Robert and George are in the South Metropolitan District School in Sutton in Surrey, and Jane’s oldest son, John Nicholas Varnham is on board HMS Impregnable as Boy 2nd Class in Devonport. In 1894 Jane was admitted twice to the Greenwich Workhouse Infirmary, where she died on the 24th August that year. Louisa Pinnell Jane’s sister Louisa Pinnell who was living with her grandmother Louisa Glanville, in 1871 was working as a servant in Deptford St John’s in 1881, though she doesn’t appear at 3 Carlton Road on the census, this is the address she gave when she was admitted to Greenwich Union Workhouse on the 6th September 1881, destitute and pregnant. Presumably when her condition became obvious she lost her post and any income, though she does cite her sister “Mrs Barnham” of 6 Bennett Street as her next of kin. Her son John Robert Pinnell was born in the Workhouse Infirmary on the 6th November and they were both finally discharged from the Workhouse on the 5th January 1882. I really feared the worst for Louisa, her sister Jane did live nearby but she was probably barely managing with a possibly ailing husband and five young children, and grandmother Louisa Glanville had died at the end of 1881. It was a relief when Louisa turned up in South Wales and married George Dowding in Penarth on the 14th May 1883; the witnesses are her younger siblings Robert and Elizabeth Pinnell, so Louisa has found refuge with her mother, now living as Elizabeth Jane Lawrence. In 1891 George and Louisa Dowding and their family - which includes her son John Robert born in Greenwich - are living in Cadoxton-juxta-Barry a few streets away from her now widowed mother. By 1901 Louisa is widowed and working as the almost inevitable charwoman, living as a boarder with her youngest son, Harry, aged just 4. Her two older daughters are working as servants, and her son George, who is 12, is a foster child in a children’s home; her mother had died in 1900, and there is no sign of John Robert. In 1911 she is living in Hereford Street, Cardiff, and still with Harry and still charring. She died in 1927. John Nicholas Varnham John and Jane Varnham’s oldest son, John Nicholas Varnham, has his own page To be continued … with the two nieces Sarah Lines, born in Horsforth, Yorkshire, and Jane Tanner, born in Box in Wiltshire.